Professor Hawking said as someone who has studied gravity all his life, he was excited at the thought of experiencing weightlessness. His trip is being paid for by an American firm, Zero Gravity, which normally charges $3,750 (£1,915). It also plans to have two seats on the flight auctioned off by charities. 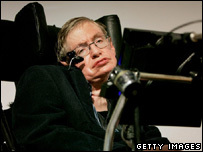 Professor Hawking, who uses a wheelchair and is almost completely paralysed, will be accompanied by medical staff. He will take off in April aboard a specially modified Boeing 727 from the Kennedy Space Centre in Florida. The plane flies to 32,000 ft (9.75km) at a steep angle and then dives 8,000 ft (2,400m) to allow passengers to experience weightlessness for 25 seconds. As the plane climbs, passengers experience being pushed down hard, feeling 1.8 times the normal pull of the Earth. In an e-mail interview, Professor Hawking said he wanted to encourage public interest in spaceflight. "I also want to show that people need not be limited by physical handicaps as long as they are not disabled in spirit," he said. Last year he spoke of how humanity needed to colonise the solar system and beyond if it wanted to survive. Professor Hawking has already spoken about his desire to travel into space. On his 65th birthday in January he said he hoped to take a flight on a space plane being developed by Richard Branson's company Virgin Galactic.